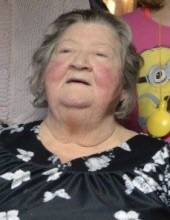 June Hancock, 79, of Weidman, passed away Sunday, January 27, 2019, at Medilodge in Mt. Pleasant. June’s funeral will be celebrated at 12 p.m. Wednesday, January 30, at Charles R. Lux Family Funeral Home with Daryl Amrozowicz officiating. The family will receive friends at the funeral home one hour prior to the service. Interment will be in Fairview Cemetery immediately following the service. Memorial contributions may be made to the family. Envelopes are available at the funeral home. June was born February 23, 1939, in Cardiff, South Wales, daughter of the late Leslie and Dardenella (Duffin) Nowell. She married Denzil F. Hancock on December 15, 1956, in Wales. She and Denzil moved to the United States in 1964. She was employed as a cook at Clinton County Infirmary in St. Johns until 1977 at which time she and her family moved to California. They returned to Weidman in 1979. Some of June’s favorite pastimes were reading, crafts, sewing and knitting, watching soap operas, and just being home. She loved her dogs but beyond anything, she loved her family. June is survived by two children, Robert (Diane) Hancock of Evans, CO, and Christine (Richard) Moon of Weidman; six grandchildren; 12 great grandchildren; siblings, Marion Neale of South Hampton, England and Robert Speck of Vista, CA. She was preceded in death by her parents, Leslie and Dardenella Nowell; husband, Denzil Hancock; son, John Hancock; and daughter in-law, Linda Hancock. To send flowers or a remembrance gift to the family of June Hancock, please visit our Tribute Store. "Email Address" would like to share the life celebration of June Hancock. Click on the "link" to go to share a favorite memory or leave a condolence message for the family.